I spent the whole of last week revamping my bread making skills. I baked and ate so much bread…enough to last me a few weeks. The first one I want to share is the Grant Loaf. 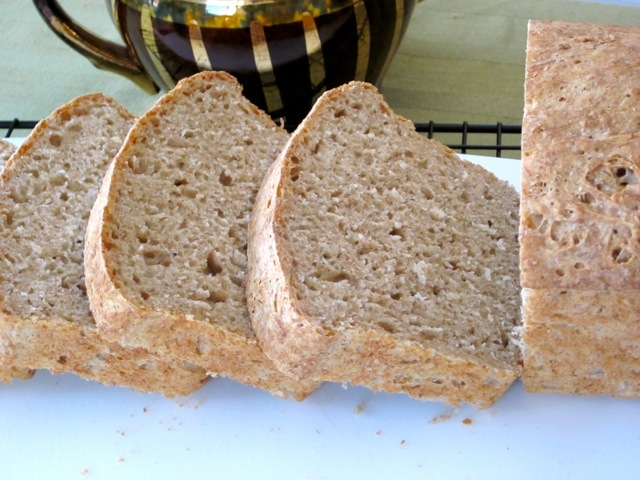 I love this bread because it’s very tasty and easy to make (easy is my magic word). It takes one minute to mix, 40-60 minutes standing time, and then it’s ready to go into the oven. If you dread kneading bread the way I do (I don’t have a big mixer) then this is the bread for you and I. If you’ve never made Grant Loaf, this is your chance to try it. Please give it a go and give me a feedback. I wish you a happy baking! Grease a 21 x 11 x 6cm (8½ x 4½ x 2½ inches) pan and set aside in a warm place. Preheat the oven to 400°F (200°C) ten minutes before using. 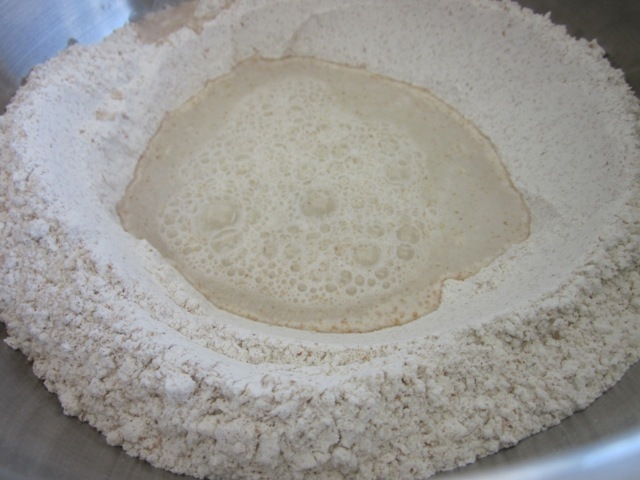 Sift the flour, salt, instant yeast, and sugar into a large bowl and make a well in the centre. Add the water and stir to form a slippery and sticky dough. Stir for about one minute working the sides into the middle. Spoon into prepared tin (pan) and cover with an oiled clear film (plastic wrap) and leave in a warm place for 40-60 minutes or until the dough has risen to 1cm (½ inch) above the pan. 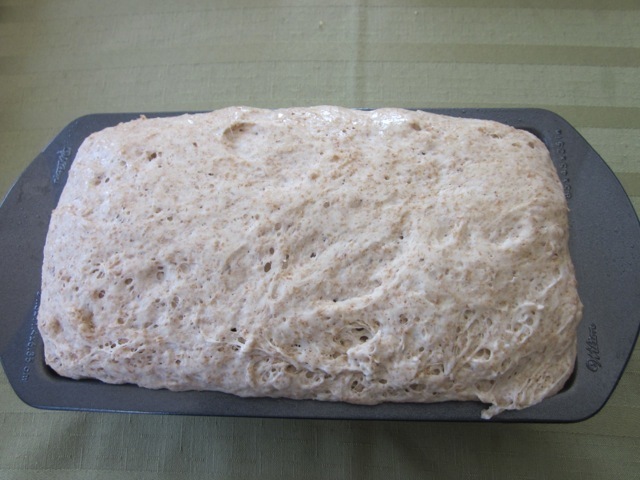 Bake for 35-40 minutes or until the loaf is crisp and sounds hollow when tapped on the base. Turn onto a wire rack to cool. Please note that oven temperatures are given as a guideline only. You may need to add or reduce the suggested temperatures depending on your oven. I baked the bread at 400°F (200°C) for 35 Minutes. 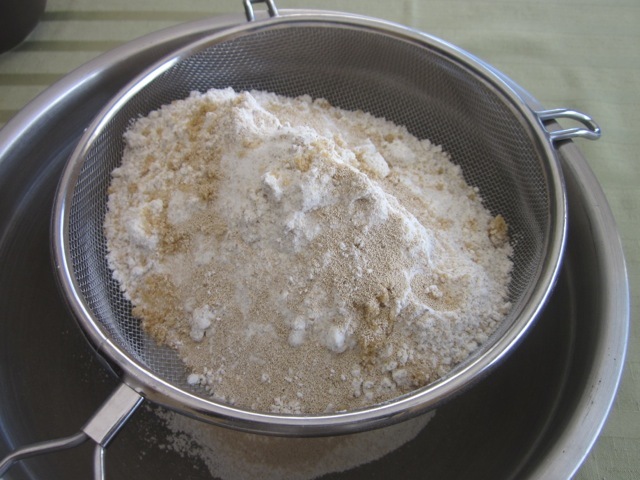 If using active dry yeast, dissolve into the water first as per your product instructions. 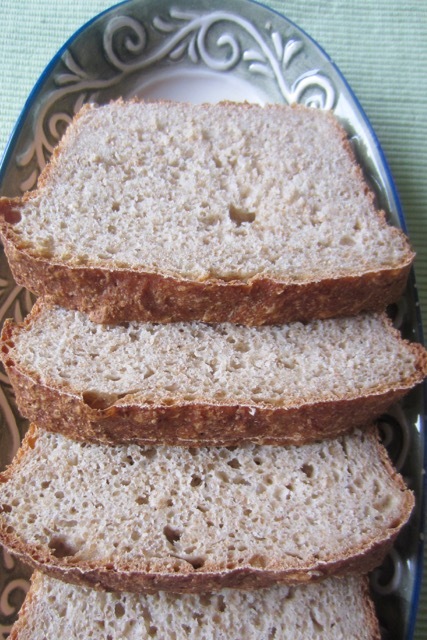 I have made this bread with white, whole wheat and a mix of white and whole wheat. 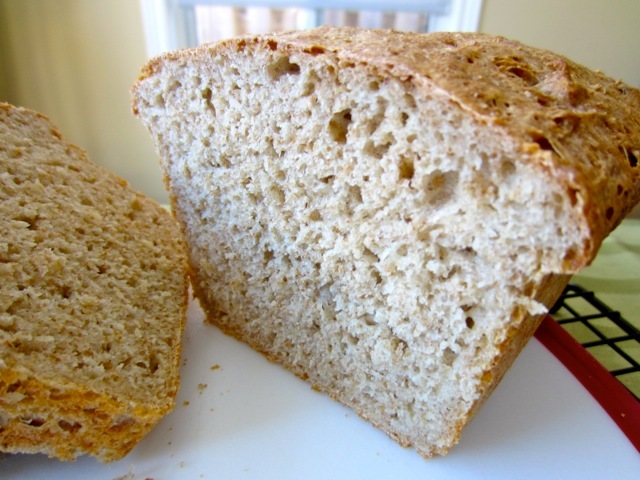 It’s best made with a mixture or just whole wheat. Suit your palate!!! I make this bread once every week. This photo was taken on March 30, 2019. Grease a 21 x 11 x 6cm (8½ x 4½ x 2½ inches) pan and set aside in a warm place. 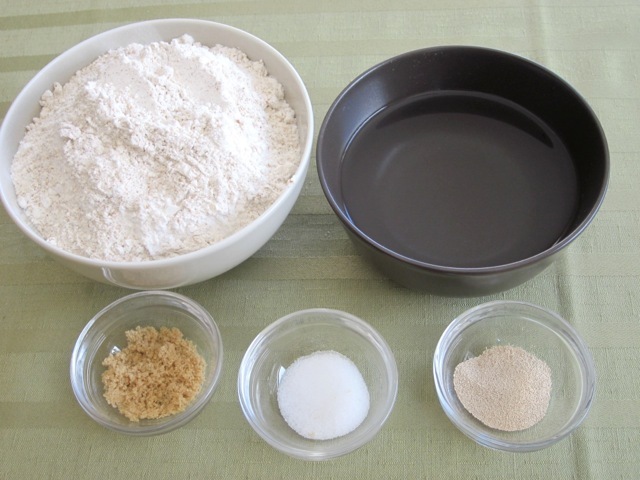 Oven preheated to 400°F (200°C) Sift the flour, salt, instant yeast, and sugar into a large bowl and make a well in the centre. Add the water and stir and mix for about one minute working the sides into the middle. It will form a slippery and sticky dough. 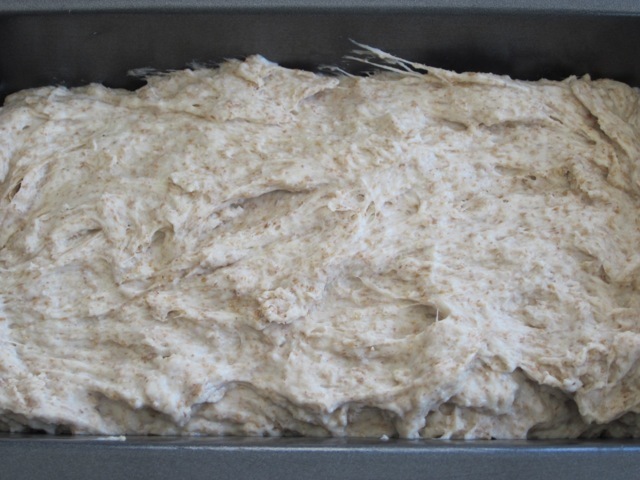 until the dough has risen to 1cm (½ inch) above the top of the tin. If you’ve never tried Grant’s Loaf, Please try it! Photo taken: March 30, 2019. I baked the bread a longer time than original photos. 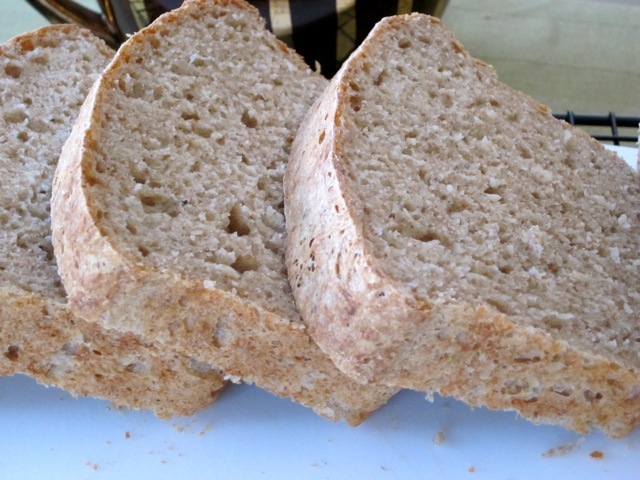 I’ll refer people to your page for this recipe and wonderful loaf in future….. Oh I also tried this loaf with Just strong white flour, It rose really well during proofing Its texture and taste along with slicing it was perfect ! Thank you so much for baking from my favourite pastime and for giving me feedback. I am so glad you loved this simple loaf. It’s one of my go to breads. I make it at least once a week! Thank you for sharing the story. Best wishes! I really have come to adore this recipe!! 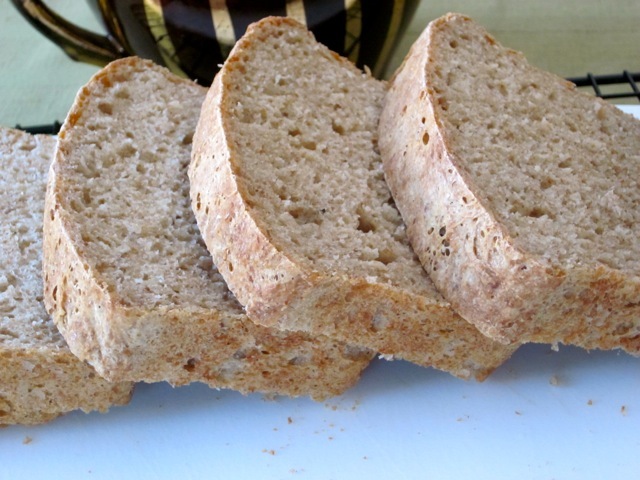 What a fabulously simple and tasty bread. I just posted it on my blog. Thank you so much!! I am so happy that you’ve come to adore the recipe. I love it too, but I think you love it more than me because you’ve baked it more times than I ever did. I shall see you post. Thanks so much for loving the bread and for posting it too! I wish you a wonderful grey day…it’s grey in the Netherlands right? Have a fabulous week!!!! Thank you. I’m glad you discovered it. Please visit whenever you can. Have a great weekend! Thank you so much for the wonderful feedback about the bread and yet it took me so long to see your comment. I’ve been posting and logging off. Today i’ve had some time to go through messages. I am so excited. I shall be baking this bread over the weekend and I shall leave it a little longer to get a darker shade. I am so glad it has become a lifetime keeper for you. Have a lovely weekend and I’m the one who should be thanking you. Thanks so much for the useful feedback! Thank you so much Afra. 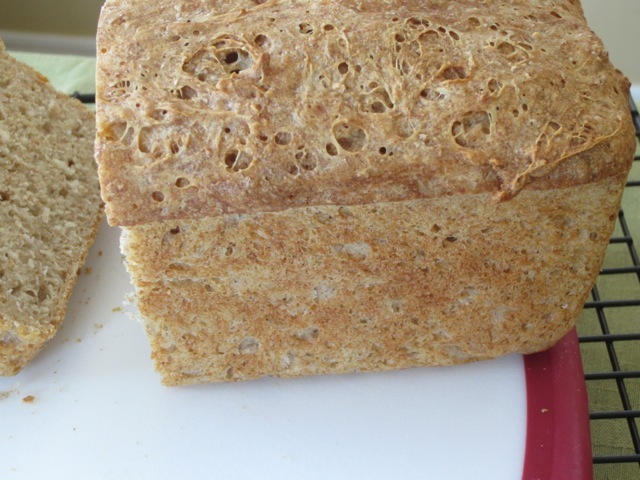 I am so glad you love the bread the way I do, I shall definitely be cooking from your blog, This is a busy weekend for me-kids have tournaments. Enjoy the rest of the weekend! Hi Liz! I just made this recipe and I just can’t stop eating. It is Delicious! I think I’ll be making this recipe a lot. Also, I was thinking of using a bit of honey instead of sugar next time… what do you think? I’ll let you know how the honey loaf turns out. I don’t think there will be much of a difference, I tried using honey in breads before and was very pleased with the result. Have a great and (hopefully) sunny week! Oh yes we have sunshine today despite the cold (-6C, 21F). I’ll also add some honey the next time I make the bread. Thanks so much and wish you the best. Oh yes, the salt can be omitted. It’s optional. Best wishes. Hi Liz, I made this today! I must admit I was a little sceptical about a bread recipe with such a short fermentation time, but it turned out great. All up it took less than 1 and a half hours- which I think is amazing for bread. The kids and husband loved it too. The four of us ate the lot warm with butter (and vegemite for my daughter). I will definitely be making this again on the weekends. Thank you for sharing this recipe. I am so glad you not only made but liked the bread. Like you I was also sceptical the first time I ever tried it, but it turned out to be one of the tastiest and easiest breads I ever made. My son loves it…I always have to tell him to STOP EATING! Thank you so much for giving me feedback and best wishes to you and your family. I wish you a very pleasant weekend! 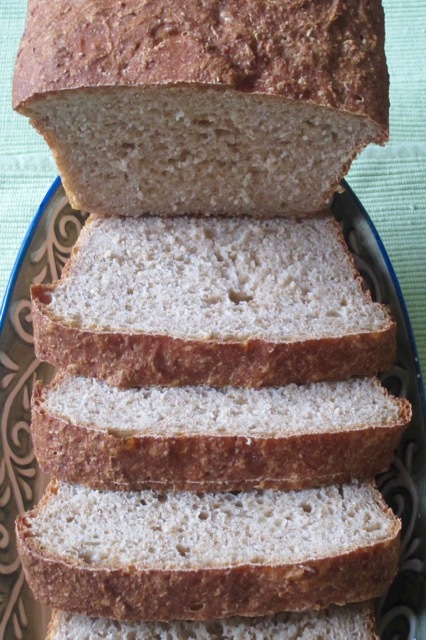 I had to read this recipe twice – really, it is this easy to make such a beautiful looking loaf?! I must give this a try! Oh yes I was skeptical too but was surprised when I finally pulled it out of the oven. I loved it! Gorgeous bread Liz, and no kneading!! That makes it more amazing. Thanks for sharing. This is a lovely loaf of bread, Liz. My first thought was, when sliced, this would have the perfect texture and consistency for a sandwich bread for me. 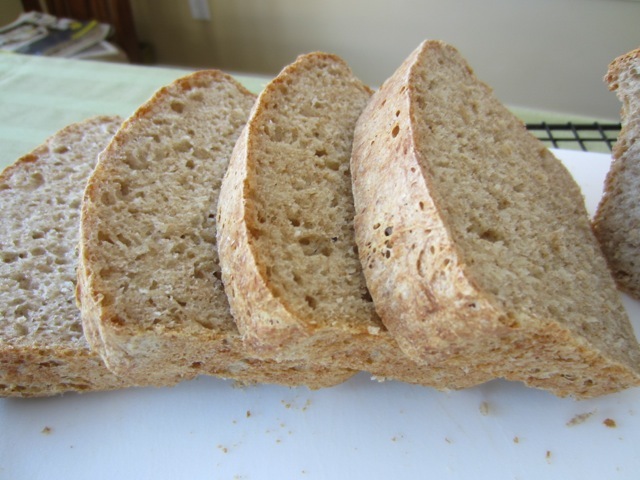 Do you use rapid rise instant yeast or just the regular yeast? I’m very excited about the no kneading required! I have a love-hate relationship with kneading. I used the Fleischmann’s rapid rise instant yeast. I am too lazy to wait for the frothing process, ha ha! Happy baking if you decide to make it. I love the bread! This bread looks delicious! Maybe even I could do it, since you said it is one of the easier breads to make. I’m sorry your weather is still cold. We are supposed to have a high of 79 or 80 today, but don’t be jealous. Come summer we will be paying for it with very unbelievably hot temperatures! The cold is still here for sometime. Lucky you with such nice weather, I am jealous…summer does get very hot here too. I love spring and fall. Happy Baking, if you try the bread. Best wishes! Oh yum Liz! I’ve only made my no knead bread once here in Hawaii because it’s too hot to turn the oven on so I’m saving recipes of yours to make when I get back home. I’m wishing great weather when that happens…in May. Yesterday we went back to Hilo to go through the Tsunami museum. Hilo has been hit many times. I cannot understand why they keep building in the same place, right by the ocean. We also went to the Farmers market. I just love looking at all the produce and learning about new things. A very nice and friendly oriental man explained about the bag of shredded green papaya, that it is eaten raw as a vegetable or in salad. Anyone else heard of this? Also we bought some reddish skinned bananas, called Cuban Reds. Haven’t tried one yet, but I did enjoy half of a rainbow papaya for breakfast….$2.00 a bag of about 7 in the bag. The bread looks so good! Best to you for the remainder of the week! You are having fun…wow. I love real markets like that one with an array of produce. I love my papaya ripe and juicy but yes green papaya is used in salads in many places. The juice from green papaya makes me itch…it has a enzyme called papain, used to tenderize meat and also helps in digestion. Maybe that’s why they eat green shredded papaya. I’ve seen those reddish skinned bananas. The best tasting bananas are sweet bananas (also known as lady finger or sugar bananas. Once you eat those one, you’ll never enjoy any other banana again. This week is still cold but sunny so I’m just sitting by the window, basking. Have a lovely Sunday, Sandy. Thanks so much for being so amicable. My regards to your family and friends! Woow you get such good bread without kneading??!!! This is soo definitely getting into my reading list. Happy Baking and please give feedback. Sounds easy and looks great . Thanks. It’s very easy indeed. This looks so delicious! Really excited to discover your blog! Thank you Laura. Hope to see you more often! The weather is better today, but we had to deal with that blizzard yesterday.. Luckily everything was shut down, so we all ended up at home before noon, and spent the day snuggled in watching movies and of course eating! I wish I would have seen this recipe yesterday, because that would have been on my list of things to do in the afternoon. But that’s ok, it’s still cold enough today, that I’ll make this tonight, and we can enjoy it with the pan of risotto I plan to make. I’m really excited to give it a try! 🙂 I did a quick Google search and found that I can substitute brown sugar for the muscovado…although I understand that it won’t be as molassesy… I wonder if I added a tablespoon or so of molasses…do you think that might make the difference for not using muscovado? I am glad the weather is sunny today although still very cold. I still have some shovelling to do: the snow plough passed the street last night and now I have that irritating mound to work on. We were in the whole day yesterday too: watching movies and binging on the Victoria sponge I made. We finished a whole cake…filled with fresh cream and cherries horrors! (LOL). I actually didn’t use muscovado sugar, I just used brown sugar and it worked fine (I toyed with the idea of adding molasses for a while). Just go ahead and use brown sugar- I should add a note that I used brown sugar. I’m yet to come across muscovado in my little town here…It was nice chatting to you. I wish you a pleasant day. Best wishes! This looks light and moist – like a kneeded bread. Very pretty loaf, Liz. Thank you Shanna. It tastes very nice too! Looks like a good way to use up some whole wheat flour. I may try this on the weekend. Happy baking. If you do give me a feedback! Made it, ate it, and it was great as I expected!!! Omg thank you so much for making, eating and liking it. I wish you a wonderful week ahead! A friend of mine, prepares a bread mixture every night and puts it in the bread machine. When they get up in the morning, fresh hot bread ready! That’s a great idea. The bread machine does all the work and voila a nice hot loaf. Maybe I should invest in a bread machine??? I have several kitchen equipment that are being thoroughly under-utilized. I wish I could be your friends guest for a week. Have a lovely evening! This looks great. I am always looking for more bread recipes! It tastes really good. You should try it sometime. Thanks! 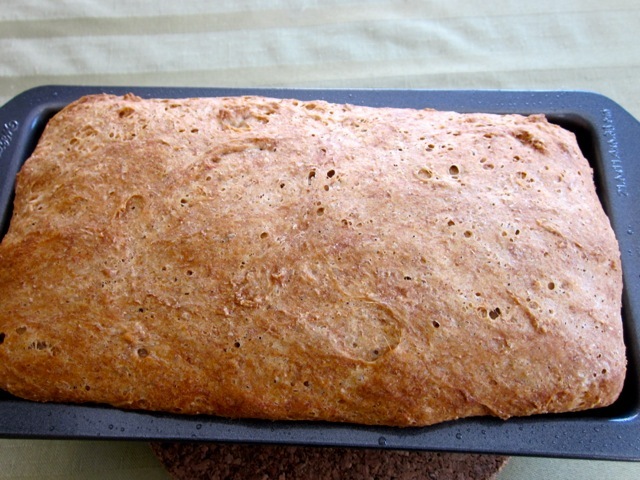 That looks great and I always admire anyone who makes their own bread…it’s something I’ve never attempt to do. You should try. It’s not so hard. Have a lovely weekend! Liz, you had me at :no kneading required”. LOL! Oh yes Hari, totally. No kneading required! How goes the weekend? Oh Hari, I’m sorry to hear you have a sight fever. I wish you a speedy recovery. Keep warm and hope the herbal concoction works for you. I wish you a pleasant week! I’m glad to hear you’re feeling much better after drinking hot water with white honey. I’ve learnt something new from you. Your biceps show that you do lots of workout…(LOL) All the best with the workout. Enjoy the week! I can just imagine slicing into this when it’s still a touch warm 🙂 Very nice with just a few ingredients and sounds so simple! Hi please don’t just imagine slicing, whip out ingredients make on and enjoy slicing it a touch warm. Slather some butter mmmm…I love fresh bread! Don’t you? Oh yes I totally agree. German and Dutch breads are really good. My friend is married to a German, I have an Original Dresdner Stollen in my pantry right now! Enjoy the wide array of breads and have a lovely weekend! Enjoy that Stollen and thank you! I’m sorry Liz, but leaving in Montreal I’m not among those who are already enjoying the spring weather… But I can anyway leave a warm comment here… your bread seems perfect, a reward you deserved to have shovelled for 2 hours! Ha ha you’ve cracked me up so I’m going to have a very good night. The snow is heading your way and I bet it’s gonna be worse over there! I shall send you some sun tomorrow, it will be shining here despite the very low temperatures. Have a good night! Thank you for your warm comment. I have received it with both hands…If it ever snows again, I shall sit on it and bawl loudly…I can’t imagine any more of that craziness. I hope the Montreal weather is awesome like here today. I wish you a lovely weekend, my dear. Thanks so much for popping by. Does it toast up really crispy? Looks like it might be like the texture of an English muffin. It toasts up extra crispy and t has the texture of normal bread. I love it! This looks so easy! I just need a weekend to try it. Happy trying. It’s very easy indeed. Enjoy the weekend!